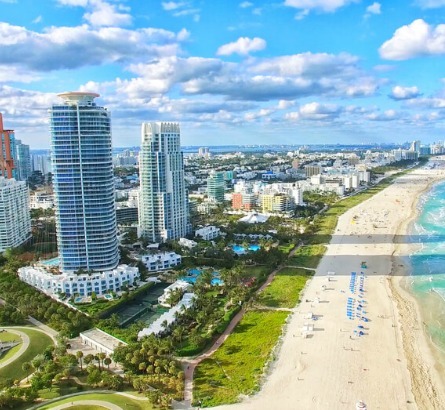 Known for its ArtDeco architecture, gorgeous outdoor spaces, Cuban-inspired cuisine, and of course, the beaches, Miami is a must-see for those craving summer adventures-- though those “summer adventures” are available year-round here, with winter temperatures averaging around 70 degrees. Check out our sample itinerary below for some suggestions on where to spend your time during your first trip to Miami! Falcon Charter Bus makes it easy to travel through Miami. No matter what brings you into the city, we’ll make sure your group is paired with the perfect bus rental for your needs. We’ve serviced family trips, weddings, business trips, school trips, and have even helped assisted living communities plan day trips in Miami, giving us the experience necessary to make sure that every group can enjoy an unforgettable Miami trip. With a city as big as Miami, it’s always difficult to narrow down what attractions you should see on your first trip; so, we’ve compiled a few suggestions based on trips our passengers have taken in the past. Below, you’ll find some of our top recommended attractions to work into your itinerary, plus some suggestions for food stops to keep your energy up while you explore The Magic City. Local transportation such as Metrorail and Metrobus are available for use, but these services run on predetermined schedules and may force your group to separate on your way to your next stop. When you book with Falcon Charter Bus, we’ll pair you with a personalized bus rental and a personal driver to take you through town, ensuring that you arrive on-time to each stop and always travel on your own schedule. Your driver will also drop you off right at each stop’s entrance, so you won’t need to worry about wasting time finding parking. Whether you’re in need of a minibus for a small group or a full-sized coach for a large group, we’ve got you covered. With amenities such as air conditioning, on-board restrooms, and entertainment options, you’ll ride in comfort no matter how far your journey takes you. You’ll enjoy waterfront views while you cruise past beautiful beaches, or take in a bit of classic Art Deco architecture while you travel through Miami on your personal bus. Wherever you’re headed, we’ll help you plan and make sure your driver knows exactly when to pick up and drop off your group. Start your trip with a morning spent outdoors at the Vizcaya Museum and Gardens, a former villa and estate of a businessman named James Deering. The grounds feature Italian renaissance gardens, wooded areas, a historic village compound, and Tuscan Italian renaissance architecture-- perfect for a walk through some of the most gorgeous scenery the city has to offer. This unique collection of street art stretches across 80,000 square feet of walls in Miami’s notable Wynwood neighborhood. Artists from over 16 countries are represented in this effort to showcase the voices and the art behind the “graffiti” that most pedestrians only notice in passing. Spend the evening shopping at Bayside Marketplace, a waterfront open-air mall that includes 150 specialty and tourist shops, cafes, restaurants, and even live entertainment. Both recognizable chain stores and unique locally-owned stores can be found among the lively and sunny atmosphere. Nearby is Bayfront Park, perfect for an evening stroll or some outdoor lounging before turning in for the night. What’s a visit to Miami without stopping by one of their most famous beaches? Lummus Park is home to the typical Miami Beach scene you’ve always watched in movies and on TV. Here, you’ll find plenty of volleyball games in progress, patrons riding bikes down the shoreline, parties, and opportunities to people watch. Since it gets pretty busy, this isn’t the perfect stop for someone seeking a peaceful, quiet beach day; but if you arrive in the morning, you can catch some quiet R&R before the real crowds head in. Formerly owned by Charles Deering, brother of Vizcaya Gardens’s James Deering, this estate is a registered historic place at which you can tour the historic Spanish-style home, hike through the grounds’ natural areas, and even examine fossils of 50,000-year-old animal bones and 10,000-year-old human remains. Near the Wynwood Walls in the arts district, Wynwood Brewing Company offers both seasonal and permanent craft beers. All brews are named after historical figures, buildings, or landmarks, through which the brewery hopes to bring attention to the significance of Miami’s historical figures. This classic Cuban restaurant has been a must-see destination for tourists and a “home away from home” to the local Cuban residents since its opening in 1971. Enjoy authentic Cuban cuisine and a dose of some of Miami’s history while you take in the “homey” atmosphere. Once featured on Travel Channel’s Man v. Food, Sarussi is best known for their “Original Sandwich” made up of baked ham, roast pork, mozzarella cheese, and pickles on homemade bread. For over 40 years, this Cuban sub shop has been a gathering place for families looking to enjoy authentic Cuban food and a warm, family-oriented atmosphere. This 60-year-old pizza shop is beloved by locals and tourists alike. Frankie’s takes pride in changing nothing about their restaurant or menu until change is absolutely necessary, which has kept their classic crunchy, doughy, and cheesy square slices popular since their opening. Trust Falcon Charter Bus to make your first trip to Miami comfortable and enjoyable. Whether you’re from Miami or you’re traveling from Tampa, Tallahassee, Jacksonville, Atlanta, or any of our Southeastern locations, we’ve got all of your transportation needs covered. Call our 24/7 reservation specialists at 305-359-3962 to get started planning your Miami trip today!